Phyllodesmium briareum – Nudibranch – There is a lot going on in those wavy arms. 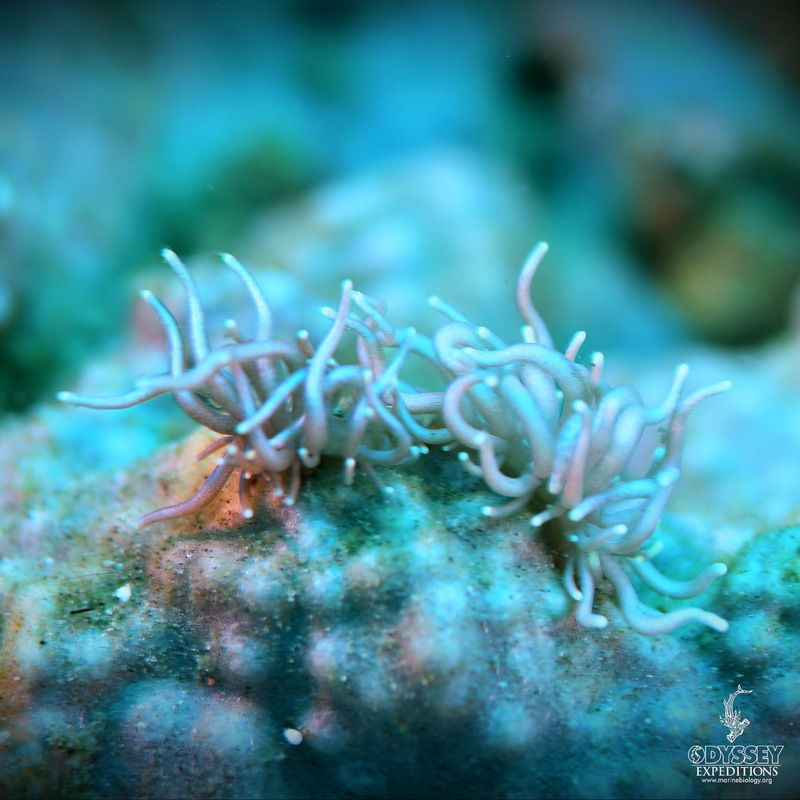 The name briareus was apparently given to it because it uses camouflage and looks like the soft coral Briareum violacea with which it is often found. Their specific name briareum comes from Briareos, one of three Greek storm giants who each had one hundred hands and fifty heads. P. briareum spends the day feeding on various kinds of soft coral, but they also have contains zooxanthellae which live in specialized ducts in the digestive gland. They do their photosynthesis thing and provide sugars. The tentacles are cerata (from the Greek word meaning “horn”, a reference to the shape of these structures) of conventional aeolid shape. Aeolids (a suborder of Nudibranchia)take their name from the Greek god of the winds, Aeolus because of the waving of their cerata resembles streamers in the wind. All aeolids have these dorsal and lateral outgrowths of the body. They are a blood-filled tube which contains a duct of the digestive gland. At the tip of the ceras in most aeolids is a sac, called the cnidosac which stores stinging nematocysts from the cnidarians (sea anemones, hydroids etc) on which they feed. Aeolids can discharge these nematocysts in their own defense. Some aeolids, such as species of Phyllodesmium which feed on soft-corals, do not have a cnidosac because the nematocysts of soft-corals are of little use in defense. Instead their cerata produce a horrible sticky secretion at the tip of the ceras. The cerata can even drop off and wriggle around, hopefully distracting assailants giving it a chance to escape. Being an aeolid, P. briareum lacks the gills found in many other nudibranches. Instead, they do all their breathing straight through the skin, but particularly through those wonderful tentacles which are known as cerata.